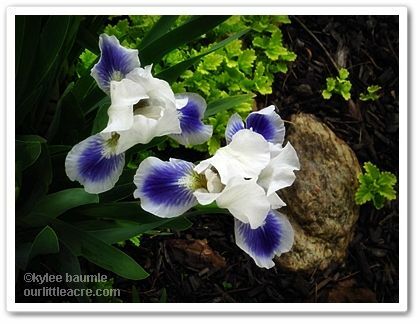 Garden2Blog 2014: Return to Little Rock! The Icterus Galbulas Are Back! "You Want to Buy My WEEDS???" We could not have asked for a more perfect Memorial Day weekend weather-wise than what Mother Nature served up this year. It was just delightful and much of the time was spent in the garden. We needed that time to do some catching up, after the long winter and petulant spring we've had here in Ohio. 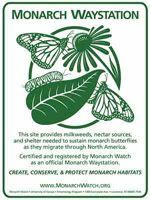 As I was working away, pulling some of the 40 trillion Washington hawthorn seedlings and encroaching grass from the garden beds, I noticed a familiar butterfly fluttering nearby. It was the first that I'd seen an American Lady this year and she gave me a treat as lovely as the day. 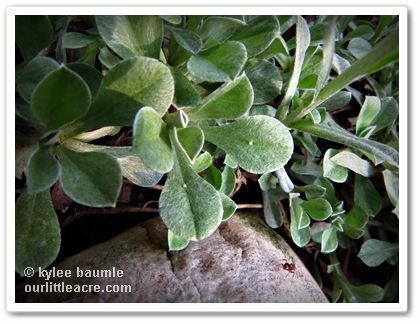 Antennaria rosea has silvery-blue foliage that's a little fuzzy. 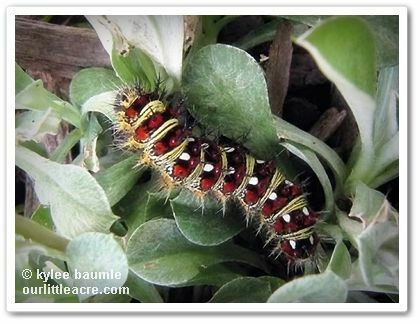 Each year, our pussytoes groundcover (Antennaria rosea) is host to a large number of caterpillars. I first noticed them several years ago, because they were so numerous. I took a photo and went inside to see if I could identify which butterfly or moth they belonged to. Turns out that Antennaria spp. 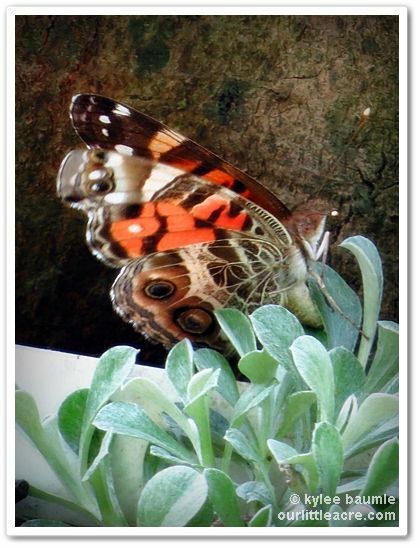 are just what both the Painted Lady and the American Lady like for raising their young. 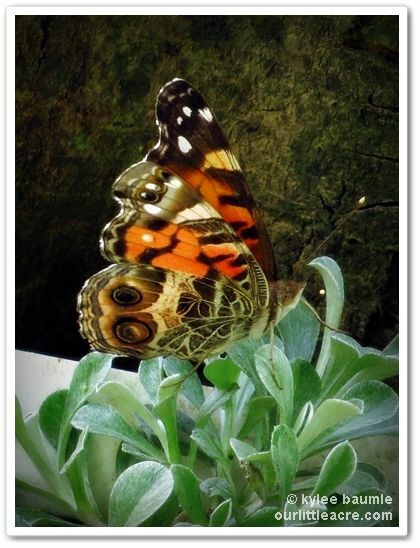 The two large eye spots on the lower wing identify this as an American Lady butterfly. There were at least two adult butterflies crawling all over the pussytoes today and I was able to get photos that were good enough to make a positive ID. I even got a photo of one of them depositing an egg. Soon, we'll be seeing baby American Ladies crawling among the leaves, eating to their hearts' content. This American Lady butterfly is depositing an egg on the underneath side of a leaf. right in the crease of the leaf. Sometimes they will deposit the egg on the underneath side. 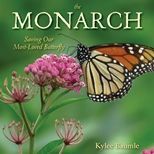 Are there any butterflies that choose to raise their young in your gardens because you are raising the right plants to host them? 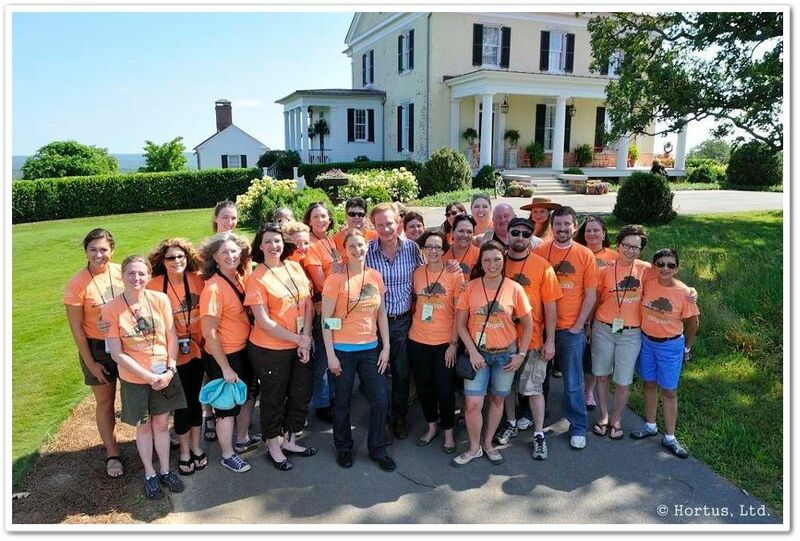 There will be more to come about what we did, but for now, let's get happy with the Garden2Blog bunch at P. Allen Smith's Moss Mountain Farm near Little Rock, Arkansas! 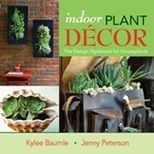 Want to win a prize package of gifts from some of the Garden2Blog sponsors? Just go to Allen's Facebook page, "Like" it, and then leave a comment there saying, "Kylee and Marge sent me." (Marge is Allen's cat that he rescued seven years ago.) :-) Do it by Friday, because that's the day they choose a winner! Good luck! My transportation, food, and hotel accommodations were provided by Hortus, Ltd. and P. Allen Smith. 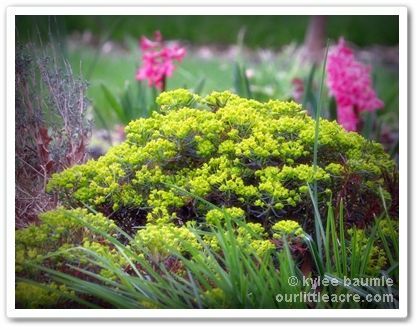 Once upon a time, I bought a Daphne 'Carol Mackie' shrub. I bought it because its fragrant pale pink flowers and its green and yellow variegated foliage caught my eye and my nose. It's one of those decadently delicious fragrances that makes you want to just stand as close to it as you can and sniff it for a very long time. But daphnes can be belligerent things, and mine was no different. They're notoriously fussy about growing conditions, but I was certain that I could grow it. Never mind that we have mucky, heavy clay soil. I amended it and knew that it couldn't be that difficult to make it grow. After all, that's what plants want to do, right? Well. It didn't last through the first winter, which was a pretty mild one. I was so disappointed. 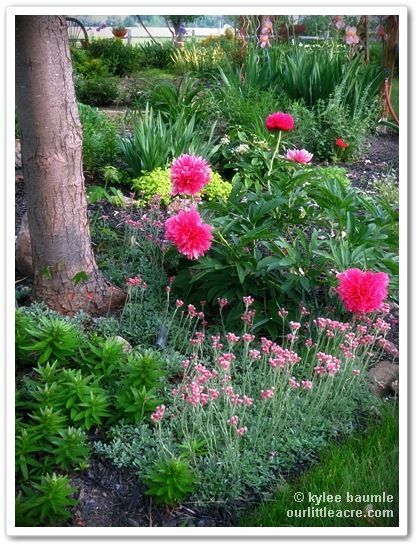 A couple of years passed, and I was taking a walk in New Haven, Ind., with my husband, and came upon a beautiful garden. The owners were outside and graciously let us walk around to see it better. And there was the most beautiful Daphne 'Carol Mackie' I think I'd ever seen. I was so envious. I resisted purchasing another one, because for one thing, they aren't the most inexpensive plant to buy. And I just wasn't sure I wanted to try again, only to be disappointed once more if it died. But then I saw an even bigger one at The Perennial Plant Peddler near Findlay, Ohio, and that did it. I was getting another one. I hadn't seen any in local garden centers, so I did what Ann, the owner at PPP had done years before. 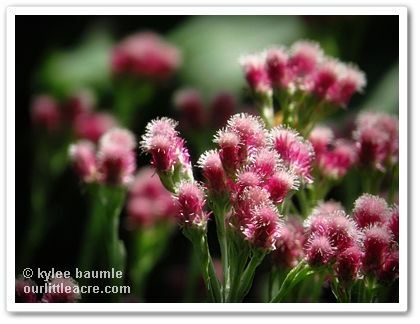 I ordered one from Bluestone Perennials in Madison, Ohio, and it was delivered in the spring of 2011. It was small when it came and I wasn't sure where I was going to put it, so I got it in the ground in a raised bed we'd made and there it stayed for the summer. The daphne did quite well that year, and I never got around to moving it to a permanent location. 2012 came and went and the daphne kept growing. I kept hem-hawing around about where I really wanted it and yet another year went by, and that brings us to the Winter That Was. If any winter was going to do my daphne in, it was last winter. It isn't the cold that is particularly tough on it - it's hardy to Zone 4 - it's the drainage. It needs very good drainage. The raised bed planting no doubt helped. But I didn't plant it in an ideal location because after all, it wasn't going to stay there, right? It was in full sun, out in the open with no protection from harsh winter winds - both of those things no-nos. But it thrived. 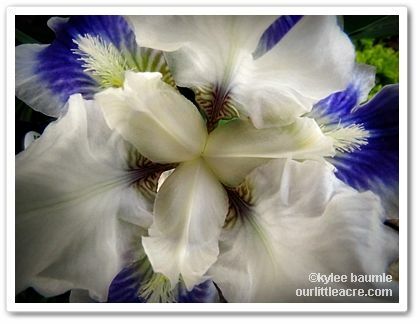 This spring, it budded out and bloomed gloriously. I was ecstatic. Now I wanted to put it somewhere else. We needed the raised bed space for growing veggies and it wasn't the proper location for such a beautiful shrub anyway. We had lost our Scotch broom over the winter (*sniff*) and the daphne would be wonderful placed there, on the east side of the greenhouse, in part shade, protected from the winds. Just one more problem: you aren't supposed to move a daphne once it's established. But you aren't supposed to do that with baptisias either and I've never had a problem moving those. So I took a BIG risk. Today, I moved the daphne. I'm scared. And I'm praying it will survive. It might be frivolous and inappropriate to ask you to pray for my daphne too, but I'll be grateful if you could at least cross your fingers. No one loves toffee more than I do. It's my favorite candy in the whole wide world. I've tried toffee in so many places that I've lost track and that includes several foreign countries. I like most toffees that I've had, but there's only one that I truly love. 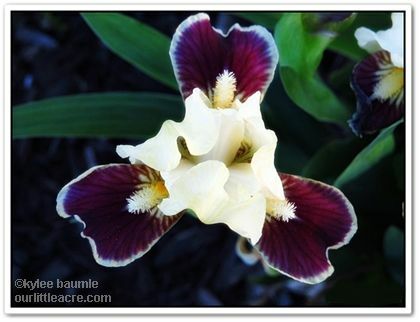 I encountered Lambrecht's Gourmet Toffee in April 2011, when I attended the first Garden2Blog event, hosted by P. Allen Smith at his Moss Mountain Farm just outside Little Rock, Arkansas. 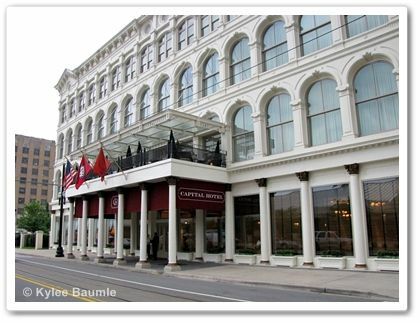 He put us up in the Capital Hotel in downtown Little Rock and one of the perks of the five-star historical hotel is that they put 3-ounce bags of Lambrecht's Toffee on your pillow each night. Now I got excited when I saw that it was toffee, but then I ate some. It was the most incredible toffee I've ever eaten. I'm not exaggerating when I say that I know it's the world's best, because there's no possible way it could be improved upon. It has a crumble-crunch that almost melts in your mouth, and it doesn't stick to your teeth like some toffees do. And the chocolate isn't waxy at all - just milk chocolate that melts as soon as it hits your tongue. Last year, I didn't get to go to Garden2Blog and I tried to get some of those who did, to feel sorry for me. Not because I wasn't going to be there for all the fun (which I certainly wanted to be, too), but because I was going to miss out on the toffee that I love so much. And you know what? A couple of packages of it showed up in the mail. Now those are true friends, that will share Lambrecht's Toffee with you. I'm not that good of a friend. I won't share it. LOL. 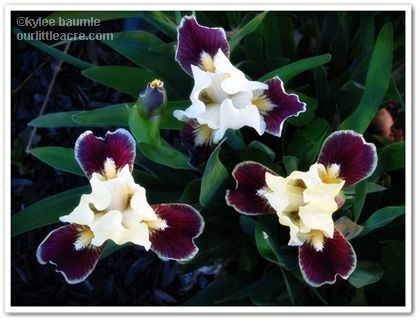 Next week, I get to experience Garden2Blog, The Capital and Lambrecht's again. I'm going to try to find the toffee there in one of the local businesses so I can take some home with me. And then I'm going to hide it. Boy, do I feel blessed. Or lucky. Or both. In 2011, I got to visit someone who became one of my favorite people, who lives in a house on a property that most of us just dream about. 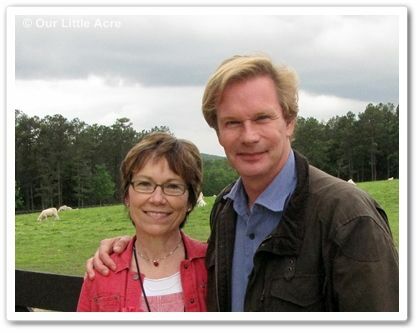 It was the very first Garden2Blog, held at P. Allen Smith's Moss Mountain Farm just outside Little Rock, Arkansas. Twenty (give or take) garden bloggers from around the country spent two days touring private gardens and whooping it up at Allen's farm, all the while learning great stuff about plants and gardening and garden products. We garden bloggers enjoyed each others' company too, because you know when that many people who enjoy the same thing get together, all kinds of shenanigans are sure to happen. Some people call it networking. Whatevs. Then the next year came along and lo and behold, I got to go again! About half the bloggers in 2012 had been there the year before and half of them were first-time attendees. Just when I thought it couldn't be as fun as it was the first time, it was even more so. And this time we didn't have a tornado breathing down our necks. We had the best time. Again. I was pretty sure I'd had all the fun I was going to get to have at Moss Mountain Farm those two years, but guess what? I got invited back this year! In about ten days, I'll be heading to Little Rock again and you can bet I'll be cherishing every moment I spend there, because for SURE this will be the last time, I just know it. And boy am I grateful for what I know will be a third charming time. The festivities have actually already begun. Two weeks ago, we were sent a package from one of the event's sponsors - Jobe's Organics - and we were instructed to use the materials to plant a container and video the process. We got a plastic container, some Jobe's Organic potting soil, some Jobe's Organic fertilizer, and a $10 gift card to either Lowe's or Home Depot to help buy plants for the container. Mine was from Lowe's, since that's the closer store to me. I did it in one take, which is a good thing, because I would have hated to have to put those plants back in their pots and the potting soil back in the bag and do it all again. Make sure your pot has a hole for drainage in the bottom. I had Romie drill one in the bottom of this pot because it didn't already have one. 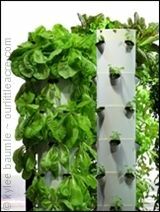 You can use a container with no drainage hole, but you have to be really careful about overwatering if you do that. This potting soil didn't already have fertilizer added to it, so I put the proper amount in it (according to package directions) before adding the plants. The old formula of Thriller + Filler + Spiller still works well. I used Juncus grass as my thriller (something tall), Dahlia 'Pooh' as my filler (medium height), and Nemesia Sunsatia® Lemon as my spiller (something to spill out over the side). All three plants like pretty much the same light and moisture, so watering will be easy to manage. Because containers dry out faster than in-ground plantings, keep an eye on them, especially during hot and dry weather. Don't forget that wind can dry out plantings faster, too. And when you water, do it thoroughly, until the water runs out the bottom. Let the top inch or so dry out before watering again. Most plants don't like to be sopping wet all the time. Since you're watering the containers often and water runs out, the fertilizer may need to be replaced every so often, depending on what kind you use. Some potting soils have extended release fertilizers but the Jobe's I used is organic, unlike those other ones that last for three months or so. Organic is good. If any of your plants start looking sad as the season draws to an end, take those out and replace them with something new that goes with your theme. 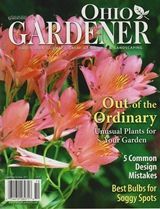 By that time, the garden centers may have some good deals on some suitable replacement plants, and you'll have a whole new look to your container! I mentioned a theme, didn't I? My theme for my container in the video was to plant something for the hummingbirds. They're drawn to red, which the dahlia provides and I added a hummingbird feeder in red and yellow colors that echo the flowers. We'll see if the hummers find it! 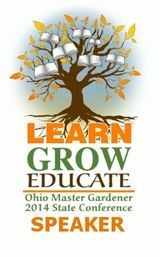 As I said, the planter, soil, fertilizer, and a $10 Lowe's gift card were provided by Jobe's Organics and the container video project was part of the P. Allen Smith Garden2Blog 2014 experience. I paid the amount over $10 needed to buy the plants and the hummingbird feeder. I hear them before I see them, and their bright, beautiful song is what announces their return. One calls and the other answers. I scour the trees, looking for their bright orange feathers. 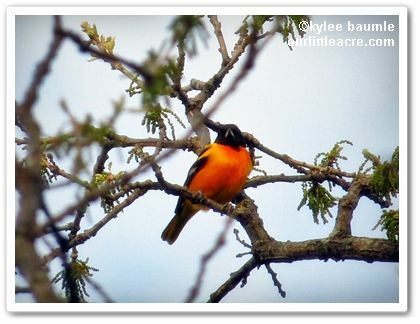 And there they are, usually in a pair - the Baltimore Orioles. 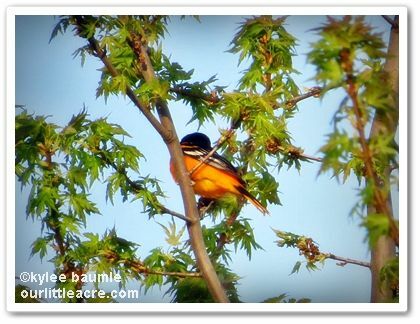 We first spotted the orioles in one of the maple trees that gave us sap for syrup a couple of months ago. They come every year and make their home in our trees, usually the half-oak in the back yard. It's a very tall, very old oak tree that lost half itself in a storm several years ago. Winds can be fierce in this part of the Midwest, which is why the tree split down the middle. 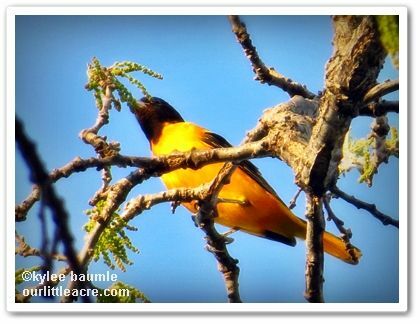 It's also why the oriole's nest blew out of the tree one year, in spite of the magnificent way they build their pocket nests to survive such things. This one was making a snack of the oak tree's catkins. It was a very windy day today, which kept me from going to the garden to work up the soil and get some seeds planted. It would have been a challenge to get the seeds in the ground without them blowing away. But later in the day when the winds had died down a little, I walked out to take an account of what still needs to be done in the way of clean-up. And then I heard them, singing louder than a robin, more melodious than the cardinals, and a far cry from the monotonous woodpecker's trill. I hadn't grabbed my glasses on the way out, so I had to employ the eyes of my husband to locate them high in the trees. We were quite the pair, since he has hearing issues and there I was, only able to really focus well at a distance of about five feet. But between the two of us, we found them - two males - first in the maple tree, and then the oak. It was windy, but this guy was fluffing himself up on purpose. 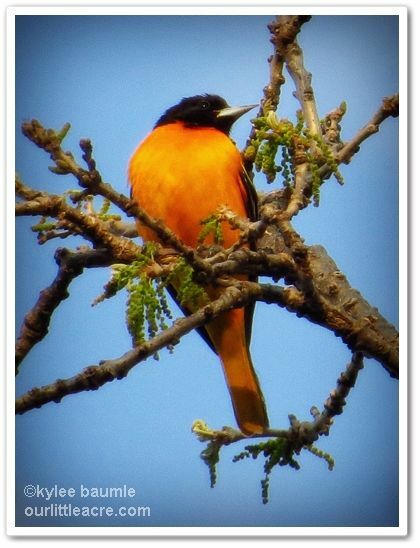 Baltimore orioles are only found here in spring and summer, migrating south to Mexico and northern South America for winter. It's common for them to return to the same nesting area each year, but they seldom will use the same nest. They may take bits and pieces from an old nest however, when constructing the new one. We have an oriole feeder, which has small trays for jelly and spindles for hanging fresh fruit, such as orange halves. 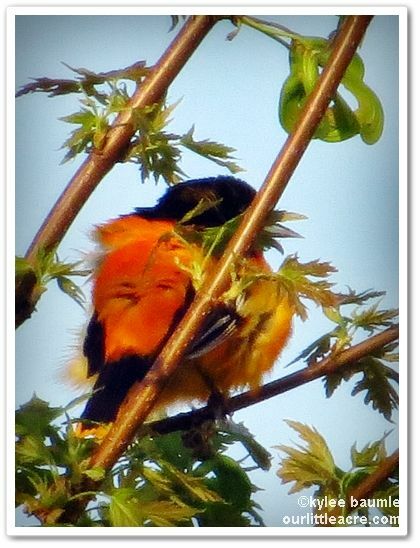 Orioles have a definite sweet tooth, but they also eat many insects. In past years, they've stayed just long enough to nest and raise a family, before moving on to another location. But while they're here, I'll enjoy their symphony of song. I'll remember to put my glasses on before heading outside too, because I enjoy seeing them as much as I do hearing them. 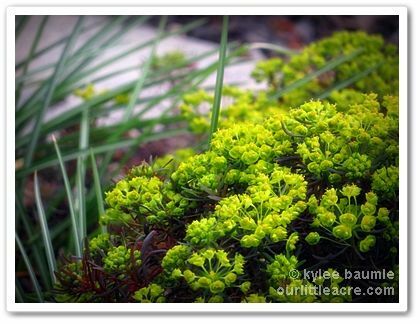 After attending the Garden Blogger's Fling in Seattle in 2011, Mom and I stayed an extra week with a family friend. 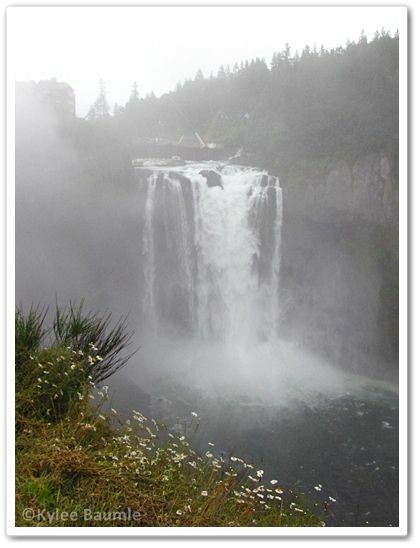 Jim, who has a home on Whidbey Island, was a first-time Pacific Northwest visitor's dream host. He took us to see so many wonderful things in the area, indulging us with visits to places of particular interest to two obsessive gardeners. We spent two days on Vancouver Island, home of Butchart Gardens, where I took over 900 photographs over the course of about seven hours. Even then, photos can't truly capture what a magical place it is. Back in Washington, we also went to Deception Pass, Snoqualmie Falls, Chocolate Flower Farm, and the Saturday Market at Bayview Farm & Garden on Whidbey one Saturday morning, among other places. While we were running around on Whidbey Island, we stopped at Hummingbird Farm Nursery and Gardens near Oak Harbor. The gift shop had some unique things, and we found the owner working in the gardens out front. We strolled through and noticed an interesting plant growing randomly here and there, and having unique, feathery foliage. Mom and I were both somewhat taken with it. We called the owner over to identify it, which he did - a Euphorbia of some sort. Then we did the unthinkable. We asked him how much they were. He just looked at us for a few seconds and then he stifled a laugh, and said, "You want to buy my weeds?" 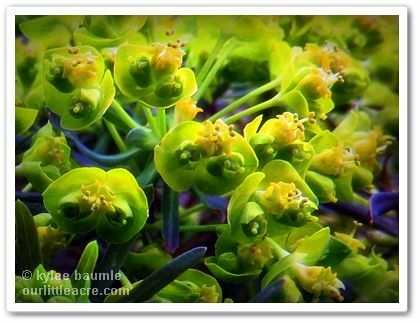 Once we convinced him that we were indeed serious about wanting to purchase a couple of these plants, because you know, we were from Ohio and all, and we'd never seen this particular Euphorbia before and we just love euphorbias, he said he'd have to think about it. "How does eight dollars each sound?" Suddenly his weeds had value. We bought them, brought them home and planted them, and right now they're in their spring blooming glory and I couldn't be happier. I still love this plant as much as the day I first set eyes on it three years ago. You know what they say - "One man's trash is another man's treasure." But I have to wonder if he's selling his weeds now that he knows there's a market for them. Or maybe he just has a funny memory of the day two Midwestern women walked into his garden and fell in love with his weeds.